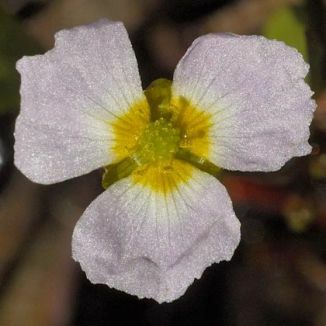 Lesser Water-plantain is not easily confused with other wild plants on this web site. 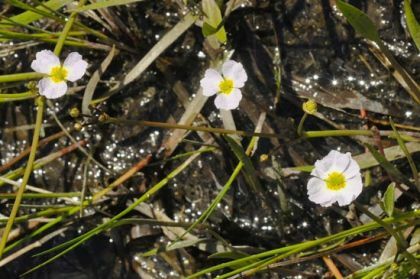 In marshes, bogs and lake margins, this erect perennial is frequently found spreading on calcareous, wet ground. As it creeps - rooting at each node as it touches the damp soil - it produces pale pink flowers (12–15 mm) which have three ragged-edge, well-separated petals and are usually borne solitarily. Towards the centre of the flower, the petals turn from pink, through white, to deep yellow and they surround numerous carpels. The long narrow leaves are mostly basal. Flowering from June to August, the plant barely reaches over 20 cm high. It is native to Ireland and belongs to the Alismataceae family. My first record for this wildflower was in Lough Derg, County Tipperary in 1981 and I photographed it near Nurney, County Kildare in 2010. I am grateful to Dr Declan Doogue, BSBI Vice-county Recorder for County Kildare for confirming my identification. This species has been assesed as NEAR THREATENED on European and Global Red Lists of Vascular Plants. The species name of this wildflower 'ranunculoides' could lead one to think it belonged to the Ranuncula family. Not so. In fact it was so named because 'ranunculoides' means 'like a buttercup', the green, nut-like seeds being very similar to those of buttercups.